Marc Chagall’s rich symbolic imagery and inspiration rooted in traditional religious themes make him perhaps the most quintessentially Jewish artist of the 20th century. Growing up in a deeply religious household in the Russian Empire, Chagall was not afraid to hide his commitment to Jewish expression, which led him to France and the United States. 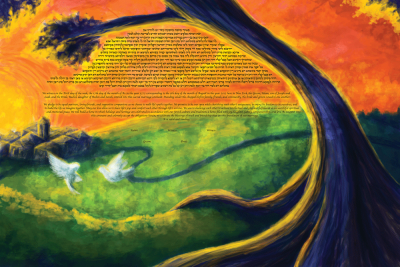 Our artistic team was excited to bring modern-minded couples a Ketubah inspired by Chagall’s love of rich color, blended scenes, and expressive depictions of Jewish life. This work skillfully weaves the classic themes of peace and nature close to the heart of the Jewish people, challenging the viewer to interact with its dramatic colors. Any couple that signs it will certainly connect with the piece’s message for years to come.